Everyday detergents found in discount retail superstores contain bleaches and other harsh chemicals that cause the fibers in fine linens to yellow, break down, or create holes in the fabric. Le Blanc® Linen Wash® was created out of the necessity for a detergent in which to safely launder fine linens such as household bedding, table linens, and antique linens. Le Blanc® products have a neutral pH formula specially designed for the preservation of all fine washable fabrics; they are free of bleach, caustics, phosphates, sulfates, enzymes, and parabens. Though Le Blanc® products are gentle on all fine washable fabrics, they are triple concentrated so only a ¼ cup is needed to be an effective stain remover against red wine, coffee, perspiration, blood, make-up, and more. Since 1985, we have manufactured and distributed only the highest quality products. 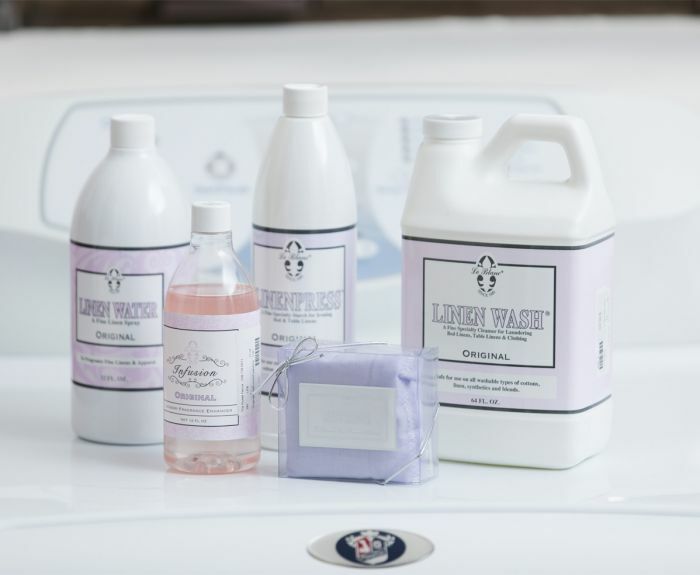 Tested and guaranteed to be the recommended choice of laundry products in the linen industry.